After almost two months in London I was amazed at some of the things the United Kingdom are doing in the Government-to-Business space. Some good, but surprisingly many not so good. I thought it'd be great to share this with you so you can better deliver services online to businesses in your jurisdiction. I’ll predominantly focus this case study around the customer journey and experience when transitioning between traditional offline marketing and the online service offering. In the offline world I saw these government programs advertised at least ten times. They were prominent and I'd be surprised if any business owner in the United Kingdom missed them. 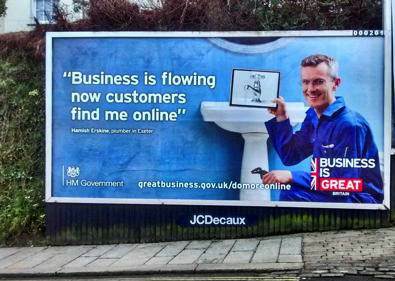 The Do More Online campaign was aimed at improving UK businesses’ digital skills so they could attract more customers. The Connection Vouchers campaign promoted government subsidies of up to £3,000 for business in eligible areas to connect to high speed broadband. While neither campaign promoted an excessively long domain name, they weren't exactly memorable: http://www.greatbusiness.gov.uk/domoreonline/ and https://www.connectionvouchers.co.uk. The first problem is obvious. The UK Government doesn’t have an integrated brand and channel management strategy in place for business customers. Two totally different domain names, and one of them not even a .gov domain is poor practice. What magnifies this problem further is the UK Government's strategic direction of consolidating its websites onto a single domain, www.gov.uk. As you can see neither campaign used the central government portal for either a marketable URL or to deliver the service. Now while technically that’s bad as far as flaunting whole-of-government directions, it actually is much better for the business customer. As I’ve touched on before (Businesslink 2.0? 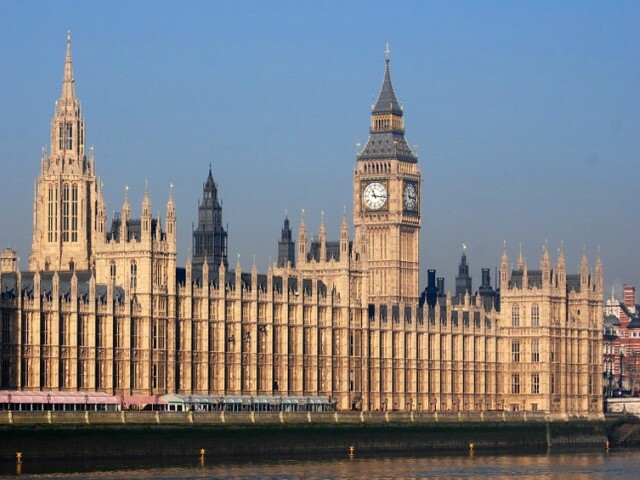 How England is going Back to the Future and UN e-government survey – what does it mean for Government Business portals?) it is far better for the business customer segment to be separated from the generic citizen offering. That said having two totally different URLs in the marketplace doesn't make sense, especially when links between the two sites are lacking as we'll explore later. Lesson 2: How do customers find you? In Lesson 1 I touched on the role of www.gov.uk as the UK Government’s single portal. One thing you can learn from the lack of hyperlinking between the two sites is ensuring related campaigns seamlessly connect within the government online space. As the two campaigns' domain names aren't memorable business owners are unlikely to recall the exact URL unless it was in front of them in a newspaper advertisement. Its far more likely if they’re out on the road driving past a billboard, or listening to the radio that they’ll remember the message of government support to business to take up broadband or improve their digital skills, but not remember the web address. The number one way customers will try to find what they’re after will be through a Google search. Using www.google.co.uk I did this for the search term “government broadband grants”. The first result was a news release on www.gov.uk which told me enough and then linked to the Connection Vouchers website. Surprisingly this seemed to be the only link on www.gov.uk to the site. But overall the experience still worked. But trying the same for “government grants digital” or “business grants digital” came up with varied results, none of which was correct. The closest was the number one search result “Finance and support for your business” on www.gov.uk. And while the support finder was well designed and laid out, on using it a crazy 633 results were found, none bearing any resemblance to digital business support. Filters existed to help whittle the results down, but none of these appeared to have any relationship to digital business. And with no free text search option I’d imagine customers would just give up. If any customers boldly tried navigating www.gov.uk they’d also be sorely disappointed. The information architecture for https://www.gov.uk/browse/business was poor to say the least. And the internal search experience was I’m sorry to say dreadful. To be honest the experience - at least for business owners - is so bad anyone outside the UK involved in e-government or government-to-business service delivery must scratch their head and wonder why www.gov.uk was put up as an exemplary government service delivery channel by some commentators a couple of years ago. The lesson for you is simple. If you have responsibility for leading a government-to-business site for your jurisdiction, make sure your operational people build relationships with the main government portal site. Ensure they cross promote any campaigns from that site and your team is working with the central portal team to have an intuitive customer devised information architecture handing customers seamlessly to your offering to business. If the experience for the poor business customer wasn’t bad enough with the lack of links between www.gov.uk and the campaigns, the culture seems to have flown through to how these two campaigns relate to each other. Now we all know that government can be siloed in nature with departments or ministries unfortunately running off separately from each other. And that is the case here. But you’d hope that common sense and customer centricity would prevail and they’d at least work together when trying to help the same customer. Business owners are likely to find both initiatives useful to their business. A rational business owner would expect that government should operate in an efficient and customer focused manner, ensuring that both campaigns link to each other. But unfortunately in this case they don’t. Neither the homepage of www.greatbusiness.gov.uk or the Do More Online landing page link to the Broadband voucher site. In fact the only instance is a case study buried deep in the information architecture. Similarly the broadband website doesn’t link back either. How can you avoid the same mistake? Like Lesson 2, it's imperative that as a senior executive you’re fostering a culture of customer centricity. This means challenging your staff to think outside their silo, ensuring they’re making the right connections across your government to create the right customer experience. The first three lessons are endemic of a single problem: an absence or ignorance of strategy. In lesson 1 I touched on the well established strategy of consolidating all UK Government websites to a single portal. But as time has gone by it appears that either departments and ministries have either found or negotiated loopholes to avoid transition, or simply ignored the strategy. You can’t blame them though. Service transition and consolidation into integrated customer-focused packages makes perfect sense. But only when done well. A quick look at how poorly www.gov.uk supports business explains why customer-centric departments and ministries are avoiding moving their site or deciding to create brand new sites. The UK Government needs to reappraise what transition to www.gov.uk has resulted in: a one size fits all view of government that doesn’t segment customers well or effectively deliver against their service delivery needs. The lack of integration between it and the two campaigns demonstrates a disjointed internal turf war within the UK Civil Service or worse, ineptitude. This lesson is clear. Whatever your government does in addressing online service delivery strategy, it must be firmly centred on customer needs and not genericised. It should also pro-actively and collaboratively bring departments and ministries along for the journey. They must be part of the formulation of your strategy so they own it and believe in it. If you don’t you’re just setting yourself up for failure. That’s not good for you, and even worse for your business customers. At this point of time you’re probably wondering why your government hasn’t beaten the British in the e-government stakes. Fortunately the UK Government does do some things right. Branding is one of them. While elements of both sites differ in look and feel, they fundamentally come from the same kernel. They both carry consistently the “Business is Great” tagline, which cleverly includes the word “Britain” after “Great.” They both use the half Union Jack and same font to tie these together. And while elements of site layout differ, they are closely aligned. If by some miracle you managed to independently come to both sites looking for the programs being promoted in the two campaigns, you’d think they came from the same pro-business and pro-growth government. Aside from actioning the earlier lessons, the one improvement that could be made by the British in Lesson 4 is better linking the brands to a central location. We’re all familiar with the well established convention of a brand image linking back to the homepage associated with the brand. The image on Connection Vouchers doesn’t do this and breaks customer expectations. So what can you take away from this lesson? What the UK does well in branding fundamentals is regrettably missed by many governments worldwide. Service delivery tends to be not only siloed in government structures and IT systems, but is often fragmented in brand and customer experience. It's a quick win for governments as business operators fundamentally don’t care what department or ministry is delivering the service. They just want the trust and confidence that they’re dealing with “the government”, so they can rely on the information or services provided. The British storm home on this lesson. While Businesslink, the earlier incarnation of government-to-business service delivery by the UK Government, got lessons 1-5 right it failed abysmally in Lesson 6. If you revisit Businesslink in the National Archives you’ll see it failed to reflect a contemporary experience online. The design is clunky and it is overly cluttered. Business is Great and Connection Vouchers aren’t like this at all. They’re simple and focused on clear customer journeys. And unlike www.gov.uk which is extremely austere in design, the look and feel of these two campaign sites could just as easily be transplanted onto an airline or bank’s website. By using a contemporary and relevant design and layout business customers are sent a clear message. Not only can you trust the sites (due to the well known “Business is Great” brand), they look easy without being dumbed down. The language and editorial style reinforces this. The lesson for you and your government is simple. Create the right visual customer experience, marry it to a consistent brand and customer-focused service delivery strategy and cross-site journeys, and your business customers will love it. Better yet, if your government can get this right and make it easier for local businesses to grow, employment and economic growth should follow suit. And that fundamentally is what all forward thinking governments want to see.